Winch Cottage01263 715779work01603 870304fax Self-cateringSocial open plan living, plenty of character and a peaceful spot with which to relax and unwind await you at Winch Cottage. Set within the rural tranquil village of Great Walsingham the cottage was once a foundry building which has been converted to provide contemporary style accommodation yet still retains high beams and characterful exposed brick and flint walls. 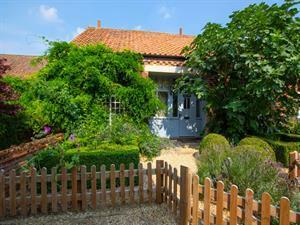 The clever mix of old and new combined with the pretty gardens with outdoor furniture, parking and 3 bedrooms (one with en-suite) all offer the ingredients for a perfect family holiday in the Norfolk countryside. Enjoy making new family memories in this stunning and diverse part of Norfolk. The coast is a short car ride away and is adorned with sandy beaches, vast openness where the sky meets the sea and marshland which is home to a plethora of birds and wildlife. There are traditional seaside towns for an ice cream or two and shops with which to pick up a souvenir to take home, historic buildings rich in history and parkland, and plenty of attractions to visit. A trip to this part of Norfolk would not be complete without trying the local delicacies such as Crab and Samphire when its in season! • Other: Towels. Travel cot, Books and games provided. WiFi. • Outdoors: Fully enclosed garden, patio, charcoal barbecue, table and chairs. Social open plan living, plenty of character and a peaceful spot with which to relax and unwind await you at Winch Cottage. Set within the rural tranquil village of Great Walsingham the cottage was once a foundry building which has been converted to provide contemporary style accommodation yet still retains high beams and characterful exposed brick and flint walls. The clever mix of old and new combined with the pretty gardens with outdoor furniture, parking and 3 bedrooms (one with en-suite) all offer the ingredients for a perfect family holiday in the Norfolk countryside. Enjoy making new family memories in this stunning and diverse part of Norfolk. The coast is a short car ride away and is adorned with sandy beaches, vast openness where the sky meets the sea and marshland which is home to a plethora of birds and wildlife. There are traditional seaside towns for an ice cream or two and shops with which to pick up a souvenir to take home, historic buildings rich in history and parkland, and plenty of attractions to visit. A trip to this part of Norfolk would not be complete without trying the local delicacies such as Crab and Samphire when its in season!